Entering foreign markets is as often frustrating as it is immediately rewarding. Reasonable expectations and flexibility in strategy are key elements in a properly conceived international business development plan. In a series of reports, Ernst & Young recently identified various factors and considerations which, although targeted at large enterprises planning to expand through JVs and/or acquisitions are also applicable to SMEs entering markets through sales channels. Various highlights and excerpts follow. "The opportunities in rapid-growth markets are undeniable. So are the potential risks...underestimate costs and...the time involved in entering markets....(You must be able to) see the opportunity...and spot complexity." "The increasing importance of rapid-growth markets to their future prospects is encouraging (companies) to look beyond the first-tier rapid-growth markets, such as the BRIC countries...into less familiar economies. Although countries such as Chian and India will remain vital destinations for invetment...leaders surveyed...say that their companies are also looking further afield, to countries including Indonesia, Thailand, Mexico and Ukraine." "Often, part of the long-term plan is an evolution from one initial market entry method to another....in some markets when you attempt to shift the relationships that you've built, your initial distribution network becomes destabilized." "Choosing a partner is about more than the numbers...the selection of partner is absolutely critical." "(Companies) can also be surprised by the complexity of distribution. In the US, a company may have only two or three distributors for its products, but in a country such as India, it may need as many as 20." "Although companies may worry that a refusal to tolerate bribery and corruption means that they will lose out on business deals to less scrupulous competitors, there is evidence that a firm approach actually yields business benefits." 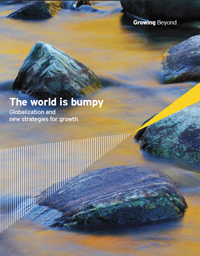 And as one of ten key guidelines, E&Y suggests that companies "Take a long-term view...there will be bumps along the way...accepting these is part of investing in rapid-growth markets. Yet in most cases, they will not affect the overall viability of the investment. Vigilance is crucial, but the costs and risks should not deter investment." "Priorities in an uncertain world....As once-red-hot new markets show signs of cooling down, and mature economies slip even further into the doldrums, global businesses face an ever-tightening squeeze. Globalization continues its inexorable march, but the challenges of becoming truly global are harder, the responses less clear-but and more nuanced, and the opportunities are no longer just there for the taking. Companies are juggling the competing demands of both rapid-growth and slow_growth businesses and figure out how to apply their resources in highly divergent business environments." And what is your strategy? Is your business international now? Really international or just accidentally? Do you have a strategy to leverage the opportunities? Are you simply hunkered down or proactively taking the opportunity to leverage the opportunities in the changing business world? Many companies understand that they should, but struggle overcoming other pressing day-to-day priorities and defer taking on the intimidating and "foreign" challenges of international business development. Consilium Global Business Advisors helps companies overcome the internal resource limitations. We help companies develop comprehensive strategies and then assist them in preparation and execution. Contact us to learn how we can help your business realize these opportunities.